You must have read all the circuits and explanation on the other pages at delabs to understand this, as i cannot repeat the same thing as i have done it more than once already. 8051 Single Board Computer - This is just like the SBC i did decades before using 80C31, before the Internet. The circuit is a 555 monostable, The push-switch is to trigger and generate a reset pulse for uC. The diode is for OR' ing later. The High will go thru the diode but the Low of 555 cannot drink any current as diode blocks. 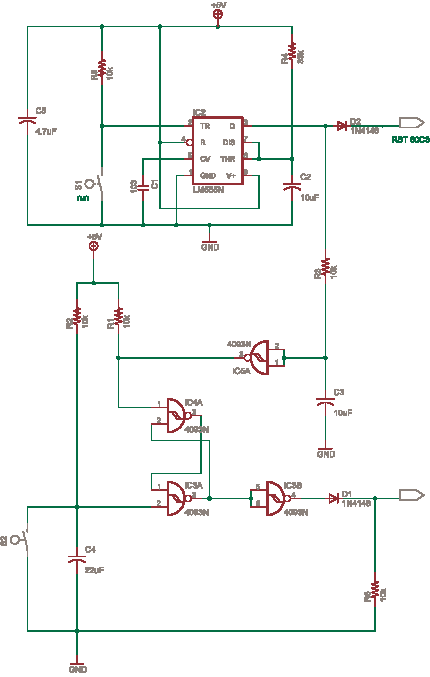 The bottom part of the Circuit is the CD4093 Schmitt nand based flipflop. What is the Schmitt then ?, It can make a sine or triangle or any shape waveform to square. It can help square a very messy waveform. Two nand gates are connected to form a flip-flop toggle switch. When 555 gives out a pulse, the pulse is delayed by a R-C which results in a ramp, the third nand-Schmitt gives out delayed low trigger to toggle nand-flipflop-switch. The Nand-toggle-switch is rest at any time with the lower pushbutton. The fourth nand output gate is not really required. But the 4093 is quad nand, so unused nand inputs should not float , pull-up or pull-down. So it has just been added in circuit so that he can fit some role, or else he will be bored. Trigger VoltageThe pulse/level at pin 2 should drop below 1/3 Vcc before the timer triggers.